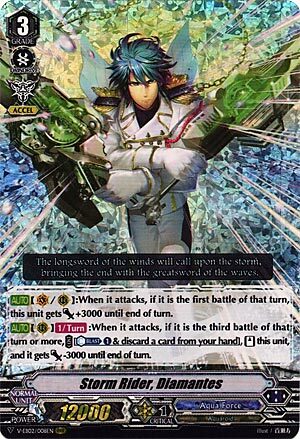 [AUTO](VC/RC):When it attacks, if it is the first battle of that turn, this unit gets [Power]+3000 until end of turn. [AUTO](RC)[1/Turn]:When it attacks, if it is the third battle of that turn or more, COST [Counter Blast (1) & Discard a card from your hand], [Stand] this unit, and it gets [Power]-3000 until end of turn. Well, I guess if nothing else it sets up the combo pieces needed to proc Maelstrom or an emergency Navalgazer at least? In all seriousness though, having to -1 to get the opponent to -1 is a bit too pricey in an Accel clan with no card advantage unique to itself. Hell, it pretty much has to be on an Accel Circle just to not get dicked over by the fact that both of its attacks are going to be 8k unboosted. I haven’t really seen anyone run this in high amounts. It’s a lousy ride and you have better ways to proc the battle numbers.